James thought it best to not have manufactured purity tests and unnecessary hurdles for people coming to Jesus. Can you imagine the guts it took for James to do this? He just back talked Moses! Yeah Moses! But James knew what we forget: Only Jesus matters. “Believe in Jesus,” James says, “and the rest will take care of itself.” If you can’t get behind Jesus, then you’re not part of us and if you’re truly behind Jesus nothing else matters. That was the first controversy. The church had to decide what else you needed to be in order to be a follower of Jesus and James (did I mention he was Jesus’ brother), said, “nothing.” People didn’t have to become Jews. No one has to change their diet or shop at different stores or listen to different radio stations. Believe that Jesus is Lord. But even though it was the first controversy in the church, the problem hasn’t gone away. We still do this. To get into some Christian schools and college (or teach at them) students and faculty must sign a Statement of Faith. 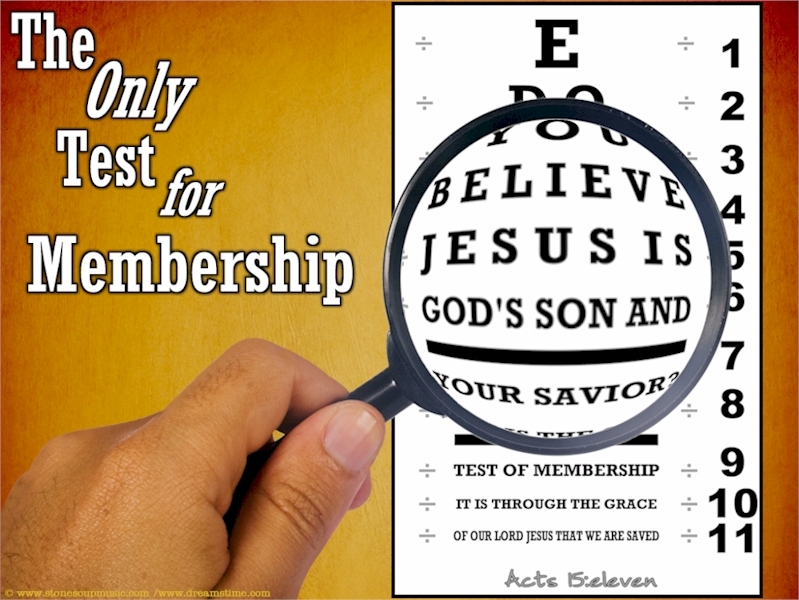 Christians visit churches and interrogate pastors about every issue before placing memberships. Church leaders launch blog bombs and Twitter terror against other church leaders when they are deemed to have strayed from some particular version of orthodoxy. “Farewell, Rob Bell” and all that. As disturbing as all this is, these instances are not the most worrisome orthodoxy tests active in the American church. What’s worse? What is our Acts 15 problem? Partisan Politics. I have a good friend who used to preach and used to blog. He quit blogging after he wrote a post about voting for President Obama four years ago. Shortly after that, he began preaching for a new congregation. When one of his elder’s wives discovered who he voted for, she never spoke to him or his family again. Not till this day. She even quit participating in church life the ways she had before. The church leadership knew this and choose to let it go. What’s more, he continues to feel that many people, including the staff he works alongside, view him with both suspicion and contempt. He’s questioned about every sermon that doesn’t sound like something Glen Beck would say. Last week, I posted a guest blog for a friend asking me about my time ministering in California and what I deemed the most significant obstacles. I wrote about partisan politics. I was contacted by several pastors who echoed the same to me, but were too afraid to say so publicly, because they feared, “If my church knew I wasn’t in lockstep with the Republican party, they’d show me the door.” You’ll have to trust me when I say, I’ve heard this sentiment too many times to count. The problem isn’t only on the Right. The Christian Left has it’s own set of particular views they hold as sacred. I know far too many writers and bloggers on the Left for whom George W. Bush could do no good and everyone on the right is a hypocritical, unintelligent, gasbag. As a matter of fact, one popular writer penned an article espousing why he/she and their spouse quit going to church. Every item they listed was political. I’m certain the writer didn’t intend this when they wrote it, but they had opted out of church because they couldn’t find a church that agreed with their left-leaning politics. We are in an Acts 15 moment. We can’t run away and turn our eyes any longer. We’ve fooled ourselves long enough. Even in the current conversations about “church decline,” few people are willing to pick up the live wire of facts – conservatives are growing older and whiter, while liberals are younger and more diverse. And evangelical churches, even the large ones, look optically identical to the Republican National Convention. This is happening while everywhere else younger adults go, the population is diverse in look, ethnicity, and thought. The church is the only place that isn’t welcoming diversity. In some of our churches, we are telling people, “To be a Christian, you need to be a Republican; you need to be a Democrat, first.” We easily call others to our politics as a test of faith, proving our faith to be not much faith at all. We seem to have lost our concern for adding to the gospel. There is a simple question we must deal with: Is politics going to come before faith? For many of us, the two are the same. And that is simply shameful. If your goal in to convert someone to Reaganism or Obamaism, you have traded the birthright of Christ for a bowl of political porridge. Your Christianity has no Christ. You have a party platform and no cross. So what are we to do? What are the steps we should take to overcome our Acts 15 problem? Did you like this post? Never miss a thing. Subscribe for other great, FREE content. This entry was posted on Tuesday, November 26th, 2013 at 7:15 am	and is filed under Bible. You can follow any responses to this entry through the RSS 2.0 feed. You can leave a response, or trackback from your own site. I fear that Jesus has been co-opted by a sub-cultures – right, left, and center. Thankfully, Acts 15 gives us a clear path forward. This post is courageous & correct! It reminds me of when people say, “Some of my best friends are (whatever version of “those people” is being discussed). It’s usually a sign that the person does not have meaningful interactions with anyone from that group. A good question for individual Christians to consider would be: Do you have a meaningful friendship with someone across the political divide? A relationship in which these differences are acknowledged, discussed w/o judgment, and covered by love? And if not, why not? If individual Christians deliberately bridged this gap in their own spheres in influence, the church as a whole would have a better chance of being politically diverse. Thanks David. Being able to have conversations covered by love is tremendously important (and a good way to put it). I would hope the church would be the precise place these conversations could take place. What’s striking is the fact that this post “is courageous,” highlights the awesome affect politics have in the church. Sean, amen, amen, amen!! Man, I so appreciate your boldness to call this out. So many preachers are afraid to even get near this issue, and that’s part of what makes it so devastating. I’d never connected politics with the scarcity of multi-racial churches, but I definitely see that link in my congregation. In some ways it’s a bigger challenge to have a politically diverse congregation than a racially diverse church. It seems to me though that a lot of people would say the recent SCOTUS decisions would fall under the “purity” section of James’ edict, while I guess others classify the decisions as humanitarian or socio-political. While those lines will often coincide with partisan politics deciding the lens through which to view the issues is a crucial first step. Thank you for the reminder that it isn’t any political ideology that we serve, but instead The Lord of All. I can not imagine agreeing with another on every political issue but I can agree about faith, God’s love for us, and his power, so everything else I leave to Him and know that He has this, and things will work out perfectly for his glory. John W. Wright, in his book “Telling God’s Story,” is discussing how much of Evangelical preaching has often capitulated the scriptures what he calls “the horizons of the hearers.” That is, preaching has sought to apply the scriptures to the status-quo lives of the people which is a life shaped by American individualism rather than calling the people from their life into the life imagined by “the horizons of the Scriptures. So he writes, “Without a hermeneutic that can challenge the horizon of the hearers by the horizons of the Scripture, the church can only respond to the society in which it sojourns and will always be captive to the role that the host society will permit it to play” (p. 39). Yesterday seem to reveal just how much the church in America, Christians on both the left and the right, are captive to the role that American culture has assigned it. The church seems only capable of either singing the praises of society exercising it’s chief value, individual liberties, or whining because society told the church once again to take it show and stand in the corner. There is a different way though. On a side note, what is interesting about what James says the Gentiles must do goes back to what the laws the Torah said “aliens and strangers” were to follow. The ideas you express are a large part of the reason why I have almost checked out of modern politics. I say “almost” because I still vote and try to stay abreast of the major issues. But I don’t watch 24-hour “news” channels anymore. I don’t engage in political arguments. And I stay away from the political hot topic de jour. My understanding is that we are to try to be like Jesus Christ. He loved others. He did good. He gave voice to the weak. And when asked about politics (“give to Caesar”), he all but dismissed the question as all but missing entire point. My opinion: have whatever political opinions you want to have. But we all better love each other. That may turn out to be the litmus test that actually matters.